Innovation by Teknor Apex Company has yielded thermoplastic elastomer (TPE) compounds with double the adhesive strength of standard TPEs when over-molded onto high-density polyethylene (HDPE) substrates, it was announced today by the company's Thermoplastic Elastomer Division. The new technology will be introduced by Teknor Apex at MD&M West in February 2010 (Booth 2115). 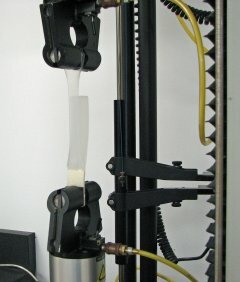 Photo shows cohesive failure of test sample, in which TPE over-molding tears while bond to HDPE substrate remains intact. Teknor Apex will use the technology to custom-compound TPEs in its Medalist range of medical-grade elastomers, according to Nick Sandland, senior market manager. "While device manufacturers are increasingly turning to multi-shot injection molding as a way to eliminate assembly, the existing 'off-the-shelf' TPEs available to them exhibit limited adhesion when over-molded into HDPE substrates," Sandland said. "New formulation technology enables Teknor Apex to custom-compound TPEs that not only provide stronger bonds to HDPE but also exhibit far less variation in bond strength, yielding a more consistent product." Teknor Apex expects to apply the new HDPE-bonding technology across the range of TPE polymer types available in the Medalist product range, noted Sandland, and can develop compounds for a wide range of applications. HDPE is commonly used in medical products because of its low level of extractables or leachables, resistance to many chemicals, and affordability. TPEs are typically over-molded onto rigid HDPE to serve as seals for vials and other fluid-storage vessels, and for connectors. In a widely used 180-degree peel adhesion test, Teknor Apex compared HDPE samples over-molded with an HDPE-bonding Medalist TPE and samples with one of the company's own standard hydrogenated styrenic block copolymer (HSBC) TPEs. The median adhesion, or peel strength, of the Medalist TPE was twice as great as that of the HSBC-42.086 pounds per linear inch, as against 21.412. In addition, the variation in peel strength among different test samples was less than half as great with Medalist as with HSBC (see chart). While the high-strength bonding to HDPE is new to medical TPEs, it is an outgrowth of technology long used by Teknor Apex for TPE cap liners for beverage bottles, an FDA-regulated application in which the TPE bonds to the inside of a rigid screw cap, typically molded of HDPE. The Medalist program for medical manufacturers includes a range of 33 standard high-purity elastomer compounds along with a comprehensive body of tools and information for designers and processors. Compounds are available with Shore A hardness from 5 to 87 and include clear, translucent, and opaque formulations. An expandable ring binder with extensive data on Medalist products is available to qualified OEMs, designers, and plastics processors in the medical device and healthcare product industries. It can be requested from the Medalist website at www.medalistmd.com or by emailing Teknor Apex at [email protected].